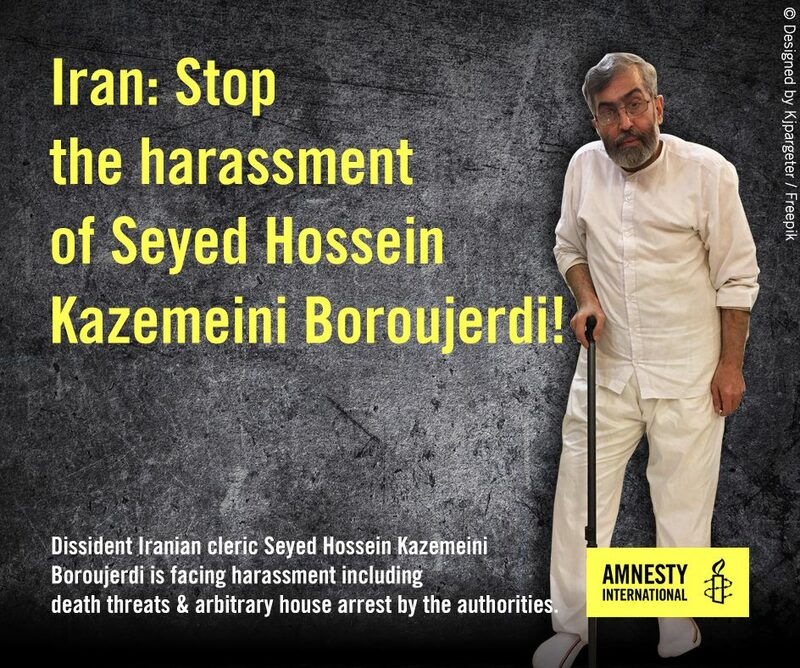 Dissident Iranian cleric Seyed Hossein Kazemeini Boroujerdi has faced continued intimidation and death threats by the Iranian authorities since his release from prison on 4 January. He is under 24 hour surveillance and has effectively been placed under house arrest. He is critically ill, and could be returned to prison at any time. Dissident cleric Seyed Hossein Kazemeini Boroujerdi, 59, has faced intense pressure from the Iranian authorities since he was released from prison on temporary medical leave on 4 January. He has been effectively placed under house arrest without judicial order or oversight; the authorities have placed severe restrictions on his freedom of movement. He is only allowed to leave his home in Tehran to attend hospital and doctor appointments. He is not permitted any visitors and his home is under 24-hour surveillance by officials from the Special Court for the Clergy. Since his release, this court summoned him twice, on 15 April and 8 August, and subjected him to intimidation and threats of being returned to prison. Officials from the court have paid frequent visits to his house to warn him against speaking to the media, threatening to kill him if he does so. Seyed Hossein Kazemeini Boroujerdi’s health remains poor. Since his release, he has had medical tests and some treatment but continues to suffer from numerous medical conditions, a number of which he developed in prison and which were exacerbated by the denial of adequate medical care in prison. These include heart disease; kidney problems; severe arthritis; lumbar herniated disc; and spinal stenosis. He has numbness and tingling in his hands and feet, back and leg pain, and has difficulty walking and performing daily tasks. He also suffers from shortness of breath and collapses frequently. His doctors have told him his medical conditions are the result of years in prison, being kept in unsanitary conditions, given inadequate nutrition, and lack of medical care. Seyed Hossein Kazemeini Boroujerdi was arrested on 8 October 2006. Following a grossly unfair trial before the Special Court for the Clergy, he was sentenced in August 2007 to 11 years’ imprisonment on charges related to his advocacy for the separation of religion and state. He has several months of his sentence left to serve. He could be returned to prison at any time.  Abolish the Special Court for the Clergy as it is fundamentally unfair and lacks internationally recognized standards of impartiality and judicial independence. Since his release in January 2017, Seyed Hossein Kazemeini Boroujerdi has been banned from writing and distributing publications, delivering speeches, continuing his teachings, and organizing ideological or doctrinal meetings. He has also twice been summoned to the Special Court for the Clergy. On 15 April 2017, he was summoned to the court where he was warned by the Special Prosecutor for the Clergy not to make any statements about the presidential election that was taking place in May 2017 or else he would be returned to prison. He was summoned again on 8 August 2017 and asked about an incident during which some of his followers and students had gone to visit him in the parking lot of a hospital where he had an appointment. The Special Prosecutor for the Clergy told him that he had no right to visits with his students and followers and that if he were to see them again he would no longer be allowed to go for hospital appointments. The Prosecutor also told him “We are worried about you. We are worried that some vigilantes will come and attack, beat you, and kill you”, a statement which Seyed Hossein Kazemeini Boroujerdi understood as a veiled threat against him. Prior to his medical leave, a number of conditions were set by the authorities for Seyed Hossein Kazemeini Boroujerdi’s release. In addition to making a hefty bond payment of three billion Rial ($USD 92,670) and presenting two bail guarantors, he had to give written undertakings to three separate security bodies, including the Ministry of Intelligence, with a commitment that he would not talk to the media or take part in gatherings of more than 10 people. In prison, he had been suffering from a number of medical conditions, including continuous pain in his bones and joints which have made it difficult for him to walk. The doctor he saw in Evin prison clinic prior to his release had told him that he may have a herniated spinal disc and he had recommended a magnetic resonance imagining (MRI) scan. 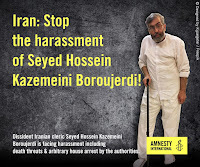 However, Seyed Hossein Kazemeini Boroujerdi was never transferred to a hospital to have the scan and he was denied specialized medical care while in prison. Seyed Hossein Kazemeini Boroujerdi has long advocated for the separation of religion from government. Prior to the start of his imprisonment in 2006, his views had led to him being summoned repeatedly before the Special Court for the Clergy and to his repeated arrest since 1995. On 30 June 2006, he conducted a large religious ceremony in Tehran during which he advocated the separation of religion and state. In the months that followed, the authorities tried to arrest him several times, but were prevented from doing so by his followers, who gathered outside his house in Tehran to protect him. Dozens of his followers were subsequently arrested by security forces in September and October 2006. On 8 October 2006, Seyed Hossein Kazemeini Boroujerdi was arrested and charged with around 30 offences, including “enmity against God” (moharebeh). His trial, held before the Special Court for the Clergy was grossly unfair. The independent lawyer whom his family had appointed for him was rejected by the court. Instead, the court provided him with a state-appointed lawyer whom he had never met before his trial. The court sentenced him to 11 years’ imprisonment on 13 August 2007 and defrocked him (he is banned from wearing his clerical robes and thereby from practicing his clerical duties). The exact charges for which he was convicted remain unclear as he was never issued a verdict. Instead, the judge read the verdict to him in court. It is believed that he has been convicted of a number of spurious vaguely-worded national security offences stemming from the peaceful exercise of his right to freedom of belief, as well as freedom of expression of expression, association and assembly. The Special Court for the Clergy holds exclusive jurisdiction over “offences” committed by clerics. These include broad and vaguely worded offences such as “counter-revolution, corruption, fornication, unlawful acts, accusations which are incompatible with the status of the clergy, and all crimes committed by ‘pseudo-clergy’, both in terms of the ugly acts they commit and the effect they have on the reputation of the clergy”. The court is regularly used to squash dissent within the clergy. The court stands outside the country’s judiciary as a separate institution and falls under the direct supervision of the Supreme Leader. Wish you a more than ever Happy Nowruz!